Hi everyone. 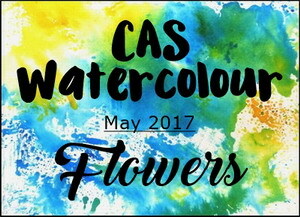 It's the start of the CAS Watercolour May Challenge - Flowers. The main panel I pulled from my stash. This is done with the Splash Watercolour technique (click HERE for my video tutorial). I used bright blue and lime green to create a colourful backdrop. I just received this pretty flower die-cut in my lastest on-line order. It was part of my order that I placed using a gift certificate from my sweet friend, Mary. Thanks Mary! 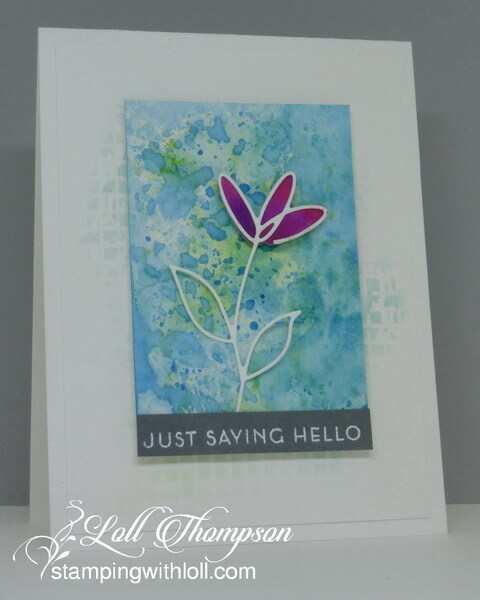 I just love the look of this die ... it gives you the outline and also the filler for both the flower head and the leaves (didn't use the leaves with this card). The flower head is cut from another piece in my stash. It's a background I made by smooshing Liquid Watercolour sprays make from concentrate. The pink, purple and red hues are really vibrant and pop off the blue background. To finish the card I added a dark gray border with a white heat embossed sentiment. We are thrilled to have Mac (The Sweetest of Peas) as our Guest Designer this month. Please click HERE to check out Mac's card, and cards made by our talented Design Team. Then come play along! I also wanted to take this opportunity to thank Harriet (Ally Cat Cards) for all her hard work and inspirational cards that she has provided to the CAS Watercolour Challenge over the past eight months. She is leaving the design team and we will miss her! Wonderful card! I love the blues and greens with the little hit of purple from the flower! The dark grey sentiment panel really grounds it. Beautiful card, Loll! I love the soft stencilling popping out from the panel, and the vivid colour of the flower head pops beautifully against the background. Gorgeous bloom, Loll! Your splash watercoloring is the perfect backdrop and I love the subtle mesh stenciling in the background! I can't wait to play along again this month, but first I need to check out your video...Thanks! I love your pretty flower, Loll! It's a perfect contrast for the splashed background! And the soft stenciling adds even more interest! A beautiful card, my friend! the die cut is gorgeous, I love the inlaid pieces and that wonderful background. stunning! and thank you for the video! Really lovely card Loll - love the flowers die and the background is fabulous. Great tutorial, as always! This is a spectacular card, Loll! The splattered background, the delicate flower with the vibrant petals, the grey sentiment strip and the subtle stenciling on the card - I love it all! This looks lovely. I really like the subtle script stamp I can just see at the edges of your watercolour panel. Your die cut pops off the page! I do like that splash of purple on the petals. Makes the flower pop of the front. Hugs Mrs A. Beautiful background, Loll and love the color of the flower in contrast to that background. What a fabulous color combination! What a beautiful scene you created! Love the colors you used. The background stencil is just the perfect touch. I love, love, love this card! It's beautiful! Where can I buy this flower die? Gorgeous background and I love the pop of pink! The purple pops, Loll, and the stencil looks like overflow from the background. Love it! Oh, Loll! What a beautiful card. I love the amazing background, Oxy does the real miracles! And I see that from the central panel emerges delicate image of a stenciled. You are a true genius.